Profound knowledge in travel management acquired! The “Travel management” educational program organized by ABT-ACTE Russia has come to an end. The teachers were the leading business travel experts. Training course participants were employees of Russian and international companies whore job duties included business travel issues. Due to an informal atmosphere, every participant got the maximum of practical information. On the day of her acquaintance with the participants, Maria Sergeeva from Luxoft described general issues of business process organization, principles of cooperation with travel management companies, business travel trends in Russia and worldwide. Elizaveta Grigorieva, head of business travel department of Lanit Group of Companies spoke about the best way to adopt a travel policy in the company. Anastasiya Smirnova, head of business travel group of Russian Post held a speech devoted to special features of communication in travel management. Marianna Uspenskaya, head of strategic purchase in Siemens LLC discussed with the audience the strategy of purchase activities, tender types, methods and principles of result assessment. 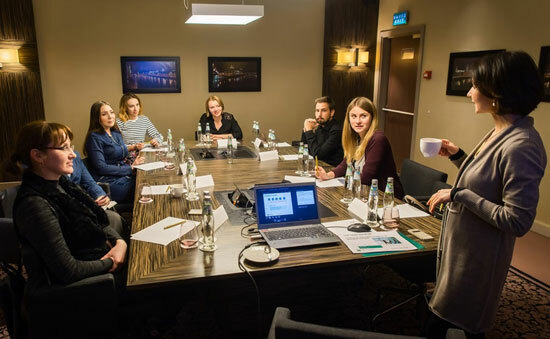 Angelika Sniko, senior event manager of Bayer, spoke about MICE (Meetings, Incentives, Conferences, Exhibitions) – the branch of business travel industry that deals with event arrangement and implementation. Special aspects of agreements and mutual settlements were examined by Elena Lutsenko, purchase manager of Saint-Gobain. What are the types of modern threats and protective measures? This question was answered by Marina Krechetnikova, administrative director of JTI. At the end of the program Vera Tchelenk, head of administrative department of BNP Paribas spoke in detain about economy measures and budgeting. “All the topics were important and up-to-date”, is the opinion of one of the participants, Svetlana Mousina, head of passport and visa group of FSUE “NAMI”. “The course can be recommended for travel coordinators who have faced a certain problem and need expert advice”. Every expert`s speech was followed by a discussion, due to which the educational process combined exchange of experience and of case studies. The attendees included staff of various companies with different approaches to travel management, which facilitated case study examination from different points of view. As the result of the educational program, all the participants received personal diplomas from ABT-ACTE Russia. The next “Travel management” course is to be held on May 16-31 this year.